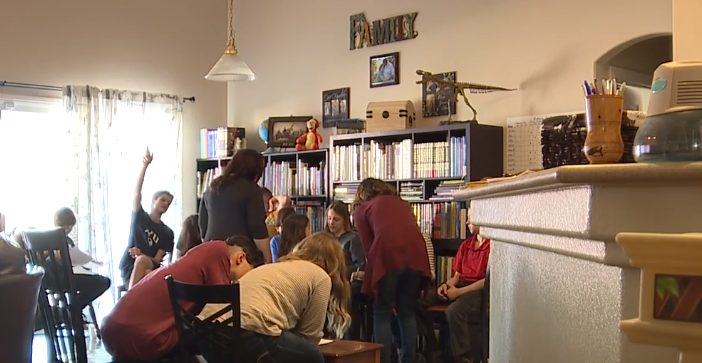 LAS VEGAS (KTNV) — The freedom to teach what they want at the speed their kids need is one of the main factors when it comes to parents deciding to home school their children. That choice also comes with challenges. Denise Kerrigan became a home school mom when her now 18-year-old son was in the second grade. "My goal when I'm teaching my kids or in the co-op setting is to get kids to think critically," Kerrigan said. The mother says she was suspicious of public school even before her youngest child was enrolled but decided on homeschooling after bad experiences with her son in kindergarten and first grade. "The biggest thing I feel is we can tailor the education to each child's needs," Kerrigan said. "They are not held up by other kids, and they are not the back of the class." Kerrigan is not alone; she is part of a co-op of other home school moms who work together to teach their kids all the things other children learn. The moms say they prefer to let their kids learn at their own pace. "If my kids are struggling on a subject we can slow down, if they are ahead we can push ahead," Shannon Hossfield said about the benefits of home-schooling her children. The parents in the co-op bring the kids together on Thursday for group classes, like the history class Kerrigan offers in her home. The experience not only adding to the knowledge but also getting them around other kids. "There are a lot of misconceptions with home schooling like your kids are going to be unsocialized," Kerrigan said. "We have a lot of family time together, so the sibling relationship with my kids is much stronger." Many of the parents who chose to home school, on top of customizing the learning process, they say the freedom to adjust their schedule is a big bonus. "So I've let her discuss with me, and we discuss together what is an appropriate amount of work for her," Hossfield said. Homeschooling does come with the challenge of parents serving as the teacher, meaning less income. The Clark County School District recognized many students enjoy the freedom to learn at their own pace. That freedom in the schedule is one of the major selling factors of Nevada Learning Academy. "We have a lot of students who are athletes or have careers, you know they are actors, models, singers," Andrea Connolly, Nevada Learning Academy's Principal said. The virtual campus offers a complete online experience for high school students. "If a student is responsible and good with time management and works hard and does well in class, they don't have to come in," Connolly said. NVLA has a limited online experience starting in sixth grade. "The student is still working at home three days a week, but the parent has the support of a highly qualified teacher," Connolly said. Gavin Williams says he enjoys the freedom NVLA offers. "I like how you can sort of go at your own pace," Williams said. While he prefers to stay at home, Williams says there are times he needs the sanctuary campus provides. "It is a more quiet environment away from the distractions," Williams said. "I came in here today for some help with geometry honors." Both options come with hurdles. One of the first barriers home school parents says they have to overcome fear. "The first thing I hear is I could never do that. I don't have the patience for that, and I tell them I don't either, you do it," Kerrigan said. "A lot of people are afraid they will screw their kids up, or they won't teach them enough." When it comes to working parents enrolling their children in NVLA, the biggest challenge is keeping them on task, or what those at the school called "falling down the YouTube rabbit hole." "It does take a parent knowing their student and if they are going to be able to work," Connolly said. There are lots of different groups offering advice on homeschooling. One of those is the Nevada Homeschool Network . If you would like more information on how to apply for CCSD's Nevada Learning Academy you can visit the school website .